These dried cherry muffins were created because during the month of January I pledged to cook with what I had in my pantry. At times it was challenging but for the most part I breezed through the month without having to go grocery shopping. It is nice to occasionally do a grocery shopping freeze and use up what is on hand. It is amazing what gets shoved to the back of the pantry or freezer and quickly becomes long forgotten –like that box of clearance priced Halloween themed Funfetti cake mix. When I was assessing the contents of the pantry I came across an unopened bag of dried cherries. Naturally, I opened them up to have a little snack while I continued my assessment. Oddly enough, cherries have been a pretty constant (and unsatisfied) craving this pregnancy, specifically my Grandma Elaine’s cherry pie. I have never tried rehydrating dried fruit before and didn’t really want to tackle a pie on my first try. I became fixated on the idea of rehydrating the cherries and using them in a baked good of some sort. Scones really stuck out. Quickly I became obsessed with the idea of cherry scones. I have made scones in the past and I knew I had shared them with you all so I quickly checked the archives for my scone recipes. Lo and behold I was stunned to see a chocolate cherry scone recipe I posted last May. They used dried cherries and were perfectly tart and sweet. So I changed directions and went with a cherry muffin using rehydrated dried cherries. I am glad I did. 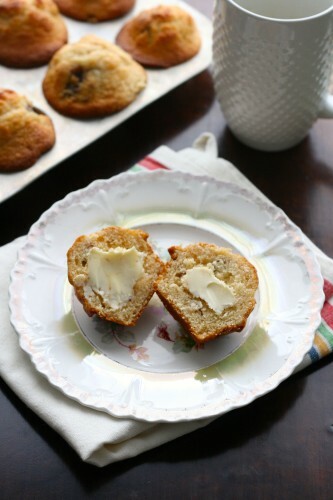 The cherries rehydrated perfectly and were delicious in these buttermilk muffins. 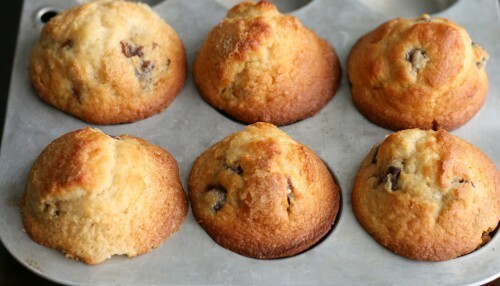 The method I used for making these muffins was the same I used when I made my Jumbo Bakery Style Banana Nut Muffins. This method I first discovered on Sally’s Baking Addiction yields sky-high muffins like you would find in your favorite coffee shop or bakery. To rehydrate the dried cherries you can soak them in water in the fridge overnight or if you’re in a pinch you can pour boiling hot water over them and let them sit for 15 minutes while they plump up. I had time on my side so I soaked them overnight in the fridge. Cherries not your thing try dried blueberries, or cranberries, or even raisins. Cozy up with a large cup of coffee or tea and enjoy your cherry muffins. Top of the muffin to YOU! Preheat oven to 425 degrees F. Spray muffin tins or liners into the muffin tins. In a large bowl mix together flour and baking powder. Set aside. In a medium bowl mix together eggs, sugar, buttermilk, oil, cherries, and almond extract. Fold wet ingredients into dry ingredients. Mix until just combined. Careful not to overmix. Scoop batter into prepared tins making sure to fill to the top. Bake at 425 degrees F for 5 minutes. Reduce temperature to 375 degrees F and continue to bake for 15 minutes. Cool in muffin tins for 5-10 minutes before serving. I am so glad they turned out. Now I have a fun new way to use up dried fruits. Thanks for stopping by Cailee –happy weekend to you too! I’m a muffin lover so I’d love to get my hands on these beauties! Great job Jamie, love that cherry flavor you are making happen here! Oh what a great idea!! I have some dried cherries lying around in my pantry too. Muffins are my favorite go-to breakfasts! SUCH a perfect looking muffin! 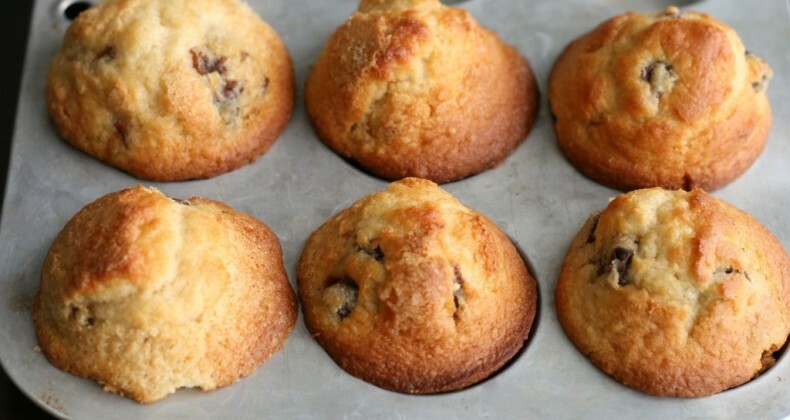 I love cherry muffins and must try these. Thanks so much for sharing at SNF! I made these dried cherry muffins for my best friend who came to visit with a huge bag of dried cherries and said to myself what a am I going to do with these? Well, I found your website and went to work!!! I had never baked or cooked with dried cherries so I learned that i had to “pop” them first and then to the baking process which by the way was done in about 5 minutes!!! I made jumbo’s and got 5 beautiful muffins, had 1 and the rest are gone!!! I received 2 calls today with nothing but praise for these muffins. Now Grama wants the recipe to make for her knitting group on Wednesday. My girlfriend says I need to become a pasty chef even though I’ve been a nurse for 24 years but have been laid off since October 2013 and no job insight. If I wasn’t 57 I would definately consider a career change. Thank’s so much for your web site. I have been on here all day just recipe hunting. It’s what unemployed people do!!! Debbie. Yogurt makes a great substitute. Thanks for sharing, Carol! Please help. I’m confused by what Debbie meant by “pop” the cherries? Also, any cooking suggestions for mini loafs? I am not certain what Debbie meant by popping them. I do not know baking time for mini loaves since I made mine into muffins. I would suggest checking them at about the 30 minute mark. If you make the mini loaves please let me know how long you baked them for. How wonderful Colleen! Thank you for sharing that. I came across this and thought hmmm, I bet I could make these gluten and sugar free. So I used 1/2 coconut flour and 1/2 almond flour (had to add water because of the coconut flour) and used 1/4 cup of pure maple syrup (also used coconut oil rather than veg oil) they totally worked! My 2 year old grandson loves them 🙂 thank you for your inspiration! Yay! Thank you for letting me know your gluten free adaptation worked. I don’t know what I did wrong but the batter was so thick. I could barely get the batter into the muffin pan. They looked good, but they didn’t taste like they looked. They tasted like I used to much flour, but I didn’t. I am sorry the recipe didn’t work for you. Some things that might have happened are the flour may have been packed too tightly into the measuring cup which would yield more than the 3 cups called for. Or maybe the batter got slightly overmixed. I am sorry you did not have the same results I had. Has anyone tried this with a mini Muffin pan? What would the cook time be? I haven’t made them minis before. If I were to try it I probably would bake them for about 10 minutes then test if they were done. If you try it let me know! I made them! 350′ in mini muffin pan with paper cups, 20mins! Perfect and they were a hit. Just made these muffins and they came out perfectly! HAD to try one right away and have to thank you for a great recipe. Made 14 good size muffins, using regular size muffin tins wih the paper cups. I didn’t until 4 or 5 yrs ago and now and then I wasn’t pleased with the texture of the baked batter. Heard on a tv cooking show to measure as you suggested ., also. Oh Bette, thank you for your comment. It brought me so much joy.